Mail4Rosey: Kohl's Cares! Pick up a $5 Item You Will Love and Help Others at the Same Time! Kohl's Cares! Pick up a $5 Item You Will Love and Help Others at the Same Time! I've mentioned it before and I'll likely mention it again, Kohl's Cares...and appropriately enough, that's the name of their $5 line, where you purchase items for a very reasonable price (most for just $5) and 100% of the net profit goes towards children's health and education initiatives nationwide. Nearly $300 million has een raised since the year 2000, which is wonderful and amazing! How does it work? Well, it actually works very easily. You stop into your local Kohl's store (which you're probably doing anyway since it's the holiday season) and you find the tall display racks they have of the Kohl's Cares items. You'll always find high quality items for just $5. Right now if you go you'll find items for adults and children. This cookbook pictured above is a prime example. It can be used to make items for or with the kids. Of course it's good for adults too...because most everyone loves baked goodies, and this book is chock full of awesome recipes. White Elephant gifts anyone? 'tis the season, and I've gone to one White Elephant Party already and have two more to attend this week. The adult coloring books are all the rage right now, so I know that is going to be a huge 'swipe me' hit in the next party I attend. The movie trivia game is awesome for the holiday season because it takes you back through the years and offers insight into movies you may have not yet seen, but will once you are introduced to them through the game. We kept this one and have been playing when guests come to visit, but it'd be a great White Elephant Party gift idea too! The holiday CD they have is PERFECT because it's full of the classic versions. I like almost all Christmas music, but sometimes I just crave them the way I heard them when I was growing up. This CD has been playing non-stop in our car since it showed up on our doorstep. It's a perfect stocking stuffer and a great item to own for your own home too. Paddington Bear is a favorite of my son. Hard to resist the stuffed animal and the book that are priced at just $5 a piece!! I know he is going to love them both when he opens them for Christmas. He and I both have a softspot for this little guy, every since we saw the movie. The pictures in the book are colorful and lively, and even Paddington himself seems to be enjoying it, don't you think? I love the tag on his jacket. Makes me want to go hug him right now. Let's talk about that hoodie!! Precious, right? This is an awesome book and stuffed animal duo. One any child will surely delight in owning. 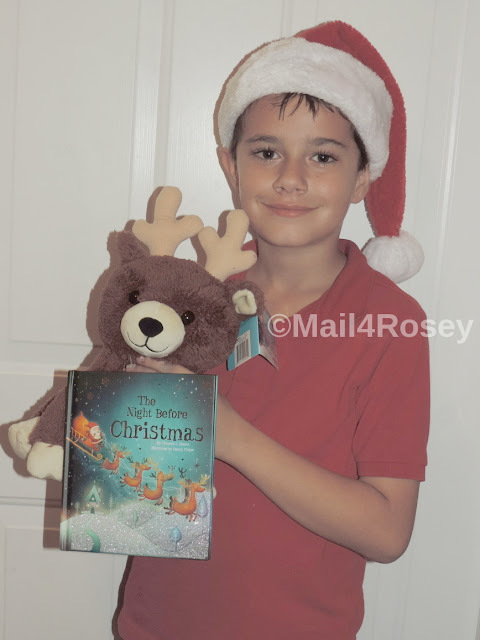 And speaking of awesome stuffed animal and book duos, you can get an equally adorable The Night Before Christmas and stuffed reindeer set right now at Kohl's too. We hand delivered this one unwrapped to my granddaughter over the weekend. This is a smaller book, for small hands, and it's perfect for reading during the holidays! Stop into a Kohl's store before Christmas gets here and take any one of these (and more!) home to your loved ones, friends, co-workers, teachers, neighbors, delivery services people and more. This is a great way to give, and give back at the same time, with items that delight (that you can also easily afford!). Big kudos to Kohl's for always being, and continuing to be so amazing! Can get some great stuff there and awesome that they have donated that much. Sure is a win all the way around. I LOVE Kohl's Cares. I shop from their selection whenever I can during the season. I think it's a great way to help others. I think this is wonderful. I love that we can help others in such an easy way while we do all our holiday shopping. This sounds like an amazing program. I have never shopped at Kohl's, I will have to check them out. I love that Kohl's does so much to give back. I always check the Kohl's Cares line for gifts. Is it possible to get a hold of the old items sold for this program. They had several items a few years ago that I would love to get for $5. Could you possibly check into it and get back to me? I'm sure my daughter would love the Paddington book and my husband the movie trivia game! It's great that Kohl's supports children's health and education initiatives! They always have the best stuff. I take my boys there all the time. I love the Paddington line. I remember the show on PBS when I was younger. Travis doesn't remember it at all. Oh it looks like Kohls has a really nice selection! I'm loving the Paddington bear and book! This is such a great cause! I am going to have to head over and see what I can find. the Paddington looks very interesting, im sure kids will love it. perfect for Christmas gift too! Aww! I love giving books this Christmas! Good to know that khol's offers a lot! It's nice to know that the profit they earn also goes to something even better. There's nothing like helping out this season. I love it when companies take on initiatives like this. The Kohl's Cares program is something I totally support. $5 gifts usually make great stocking stuffers! So wonderful that Kohl's has come up with a program like this. When companies do this, it just makes me want to buy from them some more! Kohls has really great selections, those are perfect for my kids, they would love it for sure. My son would really appreciate this kind of gift! Kohls is amazing and such a great cause! What an amazing cause! My kids will surely love this kohls items! I love this program. I also love that they have a Paddington Bear!! My son would go crazy for this. Great section to shop from! I love when companies do something this amazing to give back. I am new to Kohl's. I finally went there and I love them. Great cause! I am so amazed at Kohl's doing this. What a way to give! I really am amazing that it's 100% that they donate. Not many places give that much. Great gift ideas, thank you! I especially love that Kohl's gives back, that's something so important to me this holiday season. I love the Kohl's stuffed animals for $5. My kids have a collection of them. It's such a small thing, but a great way to help kids understand that they can do good by supporting organizations. I love that Kohl's have projects like this! Such an amazing way to help others! This is a great way to give back. I will have to check out Kohls cares for my last minute gifts. Kohl's is a great store. It is good to hear they are up to good things. Kohl's is definitely a favorite holiday shopping spot for us! Love all of these items, especially the books. We are always so impressed with the Kohl's Cares items. Nice quality products and a fabulous price. And proceeds go towards a great cause. You can't beat that with a stick! I love that Kohl's does this every year. It's a great incentive to shop at their stores, which reminds me, I need to make a trip there soon. What a great idea as well as the initiative. Donating is imperative, but we often overlook it. This is one of the best ways to help. Love LOVE LOVE Kohls Cares. Awesome way to give back by Kohl its a time of year to show others that we care! I love shopping at Kohl's both on-line and in store. Kohl's Cares is wonderful.